To save your inventory use the new button, your inventory must be open. 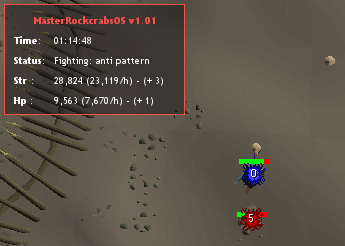 Detects when to reset Rock Crab aggro. Q: The GUI is a little confusing / can't choose what food to eat / save inventory? Will this aswell support Dwarf Cannon? I don't like the idea of dwarf cannon so probably not. All fine then I suppose. Good luck looking forward for it. It's already on the SDN I'll work on the other features tomorrow. Looking forward to see it done, set-up with all the features then. Looking for crabs and attacking them works fine for me. Allthough i think the gui is a little bit confusing since you can't choose wich food to eat. Maybe an idea to create an extra tab to select such options? 'saves your inventory' is a kinda vague to me. Anyway, keep up the good work! You can start at rockcrabs once you've saved your inventory once. - Is there any proggs or any screenshots / videos of the script going / working? If you bring a teletab with your inventory setup it should normally use if it doesn't it is bugged.